This is going to be a difficult book to review, as I feel that most points of the story could be called spoilers. The back cover and descriptions give away an awful lot of the plot, so much in that nothing surprising or shocking ever happens because you are already expecting it. So, I'm going to attempt to summarize as vaguely as possible! Rinette Leslie has been under the wardship of Mary of Guise (Mary, Queen of Scots' mother) for many years.Upon her deathbed, Mary of Guise entrusts Rinette with a box containing important secrets/information for the young Scots queen when she returns to Scotland. A while later, when Rinette goes to deliver the box to the queen, her husband is brutally murdered. Rinette then is able to use the box as a pawn: she will only give it to Mary when her husband's murder is avenged and Rinette knows she will be safe. Needless to say, the contents of the box are of special interest to many people (Catherine de Medici, Elizabeth I, etc. ), so Rinette must stay on her toes and keep alert as danger constantly surrounds her. Books about Mary Stuart are usually pretty iffy for me. She annoys me most of the time because she is either portrayed as a misunderstood martyr or a whiny brat. In The Flower Reader, she is very realistic. She is still an 18 year old girl with childish tendencies, but she is also smart and powerful. As the author wrote in the afterward, this portrayal of Mary in the few years before all of the excitement she is most known for (the husbands, exile, death) gives us an entirely different view of her. I really liked Nicolas de Clerac, the man helping and protecting Rinette. As for Rinette herself, I mainly liked her because she didn't always win. She was not perfect, but she was able to learn from her mistakes/defeats. My only problem has to do with the title. Rinette is a flower reader -- she can associate people with flowers and deduce their personality traits and future. It's SUCH an interesting concept that wasn't used nearly enough. I loved the meanings associated with each flower and how what they meant went along with each person. Rinette's reading of Mary and Henry Darnley was just plain spooky. I wished we could've seen a lot more! Overall, The Flower Reader was exciting, romantic, full of mystery, and just plain fun. 4 stars. 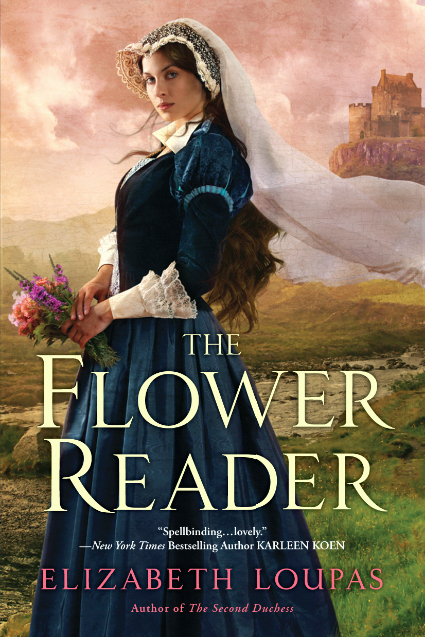 I'm excited to be able to give away two copies of The Flower Reader! One lucky winner will also receive a handmade flower bookmark as well. Entry is simple, just fill out a simple form HERE. The giveaway is only open to US residents, you have until May 9th. Good luck! Hi, Kelly... thanks so much for reading and reviewing THE FLOWER READER. It was definitely a delicate balancing act between the flower reading and the story, and you're not the only person who wished there was more of the floromancy. Then of course there are others who thought there was too much! LOL. I would love to write a followup to this and perhaps incorporate a little more of Rinette's flower magic.